NVIS Panels designed and manufactured by Stop-choc, night vision compatible (NVIS) display specialists. Compatibility with pilot night vision equipment conforming to MIL-L-85762A or MIL-STD-3009 is a common requirement. New designs or modification of existing equipment and cockpits to this standard is achieved by matching the filter to the light source. 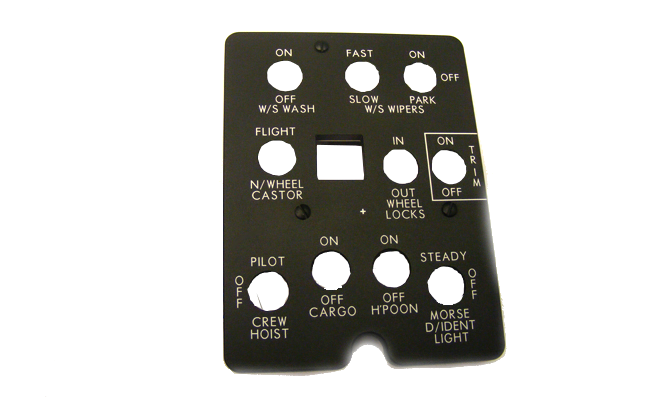 In addition to our NVIS illuminated panel range (Class 1, NVIS Green A), we also design and manufacture a complete array of NVG Compatible lighting products. As well as many new NVIS panel installations we also have extensive experience undertaking NVIS cockpit conversions. We have our own comprehensive in house testing facility compliant with industry standard testing. Our comprehensive range of NVIS panels and cockpit displays are used across the globe in both Civilian and Military applications.